This is a unique Boston team builder idea for your company outing. 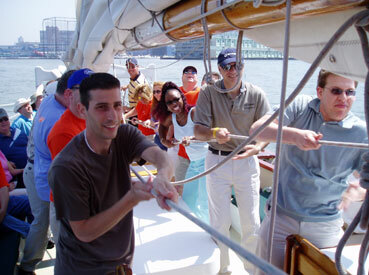 Grab your team and join us aboard Schooner Adirondack III for a team builder in Boston Harbor. This is the perfect way to bring your team together in a fun and creative way. Our crew demonstrates the procedure and the groups break up to practice using all members to execute the raising. Closed toe shoes. We’ll be moving about the vessel and closed toe shoes are a must for your safety.